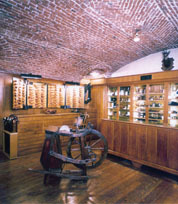 The Lorenzis, cutlers in Montenapoleone, Milano, came from Val Rendena in Trentino, in the north of Italy. The valley, before acquiring its various resources of today, once scarcely used to produce enough grass in summer to feed the cattle. This task, during the long harsh winter, was performed by the old men and women, whilst the younger more enterprising men would set off, pushing their portable grinders, in order to find a new source of work elsewhere. This emigration commenced in the second half of the last century. Giovanni Lorenzi, born at Mortaso in 1899, was one of these emigrants. After spending a few years in Germany as a grinder's boy, in 1919 he came to Milano with his brothers in order to put into practice the things that he had learnt through experience. In 1929 he settled down in Montenapoleone. At the time he only owned a small shop in whose basement he performed a very intense grinding work. The beginning was very difficult. The Lorenzi parents always remembered the Christmas Eve of their first year of business, when only one customer had bought something from them. The world crisis of those years and subsequently the bombings of 1943 that damaged the shop gave them a very hard time. Only after a while did the shop start working regularly and the "Lorenzi cutlery shop" began to establish. At first, grinding was the only source of income and the sale of knives, scissors and other accessories was only occasional and solely upon request. However, it was actually due to this slow start that Giovanni Lorenzi was able to specialize in his work, by absorbing knowledge a little at a time. He also used to keep his children by his side and whilst they were engaging in childhood games with their toy trains made from empty razor blade packets, from some broken spare parts and whatever else they could find, they were in fact learning, almost unconsciously, their father's profession. They were moulding themselves and developing their sense of observation and experimentation. An important source of learning came from the heterogeneous customers that were gathering in the street. They were not only asking for products already on sale but, more importantly, they were proposing the manufacture of objects according to their personal needs. Starting from this request and driven by a great wish to satisfy it, the Lorenzis set up their own working system: to give the customer the article he required, built in the best possible way. This system is much more laborious because it means constant research and fulfillment in the handicraft field both inside the shop and outside. The Lorenzis travel the world keeping en eye open for what is well thought out and well made. By taking the finest details and using them at opportune moments, they can find out new ideas for new creations. So there comes the difficult task of selecting the best craftsmen, who even after having been found, are not always willing to accept this unusual occupation, due to their regular practice of mass production activities. Thus comes the necessity to create the most prestigious pieces on one's own. In these articles, besides the selection of valuable materials, there is a wish to revert back to the natural ones; the desire to supply something that will last and not an object that has to be thrown away at the first sign of trouble. This is a principle of professional ethic which reveals the love for nature and for the environment to which the Lorenzi family have always conformed its activity. Wood, horn, leather, copper, brass; all reminders of mountain huts, woods and animals. Of course, natural materials are very delicate and more easily ruined both during manufacture and with use, and therefore there must be a closer relationship with the customer who has to accept these specific characteristics. In order to achieve this, there must be shop-assistants who really cooperate. They should love their job and be ready to increase their knowledge in order to transmit it to the client and in turn learn from the customer himself. Everyone may contribute to establish the Lorenzis' experience. A phrase once said by a customer pondering over two objects, intended for the same use but built in a different way and so varying in price was: "I will buy the best one because I am not rich enough to afford the luxury of spending less". This quote was one of many not forgotten during the years. In 1959 Giovanni Lorenzi returned to his mountains (where he died in 1992), leaving to his sons the responsibility of continuing his work. 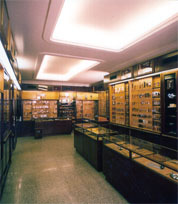 In that same year the shop was enlarged and a step was taken towards the smokers' world beginning with the sale of lighters and later completed with the introduction of pipes and other smoking accessories. As for the cutlery items, the approach was very cautious and the widening of the field, even today, is always evolving and based on a continued research. In 1983 the shop has been enlarged again and modified, but it still maintained its initial imprint. That part of the basement where once the grinding used to take place has been also restored and now houses a corner where items made by artisans of the past and considered "pièces uniques" have found their place to be shown and offered on sale. The intention is to propose them side by side to the novelties which follow one another swiftly in the modern production in order to point out the advantages that the latter presents and, at the same time, to show the valuable handicrafts of the past and to preserve the memory of them. With the same attitude a collection of the most meaningful objects of different times and origin, belonging to the range of articles the Lorenzis deal with, has grown in the course of the years; it enables, through the organization of exhibitions, an additional exchange of knowledge and experience with people more and more demanding and qualified. Gaspare Barbiellini Amidei – Aldo Lorenzi: That shop in Via Montenapoleone, published by Ulrico Hoepli, Milan, in whose shop, Via Hoepli 5, the second edition of the book is on sale.